It’s 1956 and twenty-year-old Delyle Condie is on top of the world. MVP of his college basketball team (University of Utah) and engaged to Emily, his high school sweetheart, life is looking pretty good. That is, until the second round of the NCAA t... show all ournament. Midway through the most important game of his life, Emily unexpectedly breaks off her engagement to Delyle. Heartbroken, Delyle makes the spontaneous decision to quit basketball and embark on a mission for his church. His destination: Melbourne, Australia. A city gripped with Olympic fever, Delyle’s first encounters with the Aussies are not encouraging. He struggles to maintain his spirits when faced with the indifference of the locals, but when an opportunity arises to help train Australia’s first Olympic basketball team, Delyle sees his chance to connect with them. 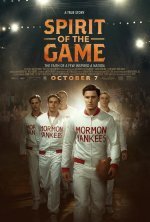 His passion leads to the formation of the Mormon Yankees basketball team, and in the run up to the Games, fierce competition with the French leads to a bloody rematch, through which Delyle and his Yankees are able to prove their faith – and their mettle – to the world.